Home » African Safari 2010-11 , Blogs , Test Cricket » The Mythbusters!!! So the biggest myth about team India has been broken after their brilliant performance during South Africa Test series. 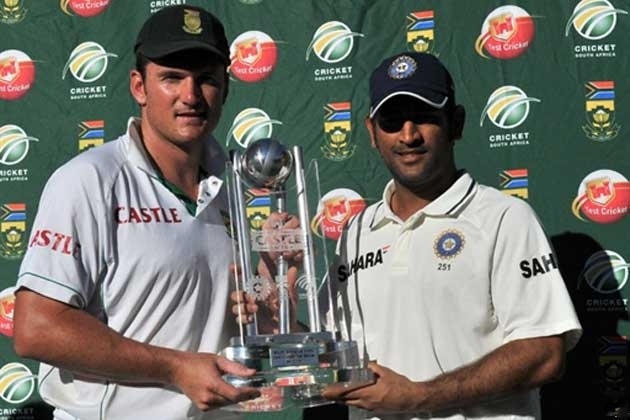 It’s the first time in their history Indian team will return undefeated from a Test series in South Africa. Now who says Indians are a lion only in their own den and they can’t play well and win in the fast, bouncy pitches?? Team India has certainly shut the mouths of their critics. Also there were lots of question marks over Team India’s No.1 Test ranking but now I guess the critics have got their answers. Team India has put a full-stop on all these speculations. If we leave the 1st innings of the 1st Test India's performance has been superb throughout the series. 2nd innings of the 1st Test was the turning point for Team India where Sachin Tendulkar scored his 50th Test century. It gave Indian batsmen a self-belief that they can score runs here too the way they do in India. Laxman’s two Very Very Special knocks at probably the world’s fastest pitch Kingsmead, Durban provided the winning platform to team India. With pace spearhead Zaheer’s return the bowling department looked completely different from what we saw during the first Test. Still remember the Test match of 1996 when Team India were bundled out for only 100 & 66 at the same venue but on 29th December 2010 Indian team overcame the Durban ghost. In the last Test of the series and the first Test of the year Team India were almost there but Jacques Kallis’ innings took South Africa to a safe zone. The Test drawn but Team India showed the world that what they are capable of. In a sense it was one of the most memorable series in the recent times. Both the teams had some great moments during the series. Sachin Tendulkar’s 50th Test Century, Rahul Dravid reaching 12,000 runs and taking 200 catches, VVS Laxman’s two back to back brilliant knocks at Durban, Steyn’s dream spell on the 3rd day of 3rd Test & Jacques Kallis’ first Test double hundred in the 1st Test and a brilliant match saving hundred in the 3rd Test despite of an injury were some of the moments cricket fans will cherish for a long time. Gambhir & Bhajji’s return to the form, Sreesanth’s rise as a match winner were some of the positives for Team India from the series. Gambhir impressed everyone by playing so well throughout the series. He is slowly settling himself as a great opener and a world class batsmen. Always thought Sreesanth can become a better bowler if he only concentrates on his game and we saw some of the glimpses of it in this series. The way both the teams played throughout the series the drawn results looks most appropriate. It was a well fought series between both the sides where fortunes kept fluctuating from one team to another. I can say the series lived upto its expectations. It would be even better if it were a 5-match Test series. Hope Cricket Boards will keep it in mind while scheduling future tour programs.